If your dad’s a meat and two veg man who loves a bit of spice, he’ll love this Rub with Love Steak Rub from Prezzybox. Great with chicken, steak or even roast potatoes, this combination of spices is guaranteed to add a zing to any meal! Here’s a fun twist on an old classic. Think beer pong but with all the gentlemanly sophistication of golf – and there you have it: Drinking Golf courtesy of Moonpig. Forget Swiss army knives. Menkind’s Wallet Ninja is where it’s at. Featuring 3 screwdrivers; 6 hex head nuts and bolts; bottle, can and letter opener; box cutter; ruler, phone stand and peeler – there’s nothing this nifty piece of gadgetry can’t do. If puzzles are your dad’s favourite pastime, then here’s a brainteaser to keep him entertained for hours. Step aside Rubik’s cube: Sudokube is in town. From Prezzybox, it’s Sudoku in cube format and it’s guaranteed to have him hooked. If your dad has a sweet tooth, then Menkind have something to hit the spot. 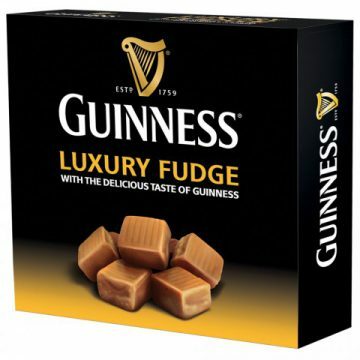 A luxury fudge box with a boozy Guinness kick. If there’s one day your dad deserves to put his feet up, it’s Father’s Day. And now he can enjoy it even more with this Dual Foot Massager from Prezzybox. Using the shiatsu massage concept, this piece of kit will have him relaxed in no time.